ROGERS, Ark. — More than a dozen Spanish-speaking parents gathered at New Technology High School one night last fall to talk about college options with the high school’s guidance counselor. In that moment, Resendiz, 23, understood that language was only one barrier among many for the hundreds of families who had recently come to Rogers from other countries. Host to Walmart’s world headquarters, a cluster of chicken processing plants and a growing local economy, northwest Arkansas has gained a reputation as a place where new immigrants can get jobs. With the influx of workers from Mexico and Central America, the Rogers school district has become 44 percent Latino, up from 31 percent, in the last decade. Of its 15,000 public school students, the percentage of those who aren’t fluent in English has grown to 35 percent from 25 percent over the same period. And because the jobs that have attracted so many people are mostly low wage, the number of students living near the poverty line has more than doubled since 2000. But in this deeply conservative corner of Arkansas — where no Democrat has been elected to Congress since 1966 — whites have not fled the public schools. No angry billboards have cropped up. Even as some Americans applaud presidential candidate Donald Trump’s denunciations of Mexican immigrants as gang members and rapists, Republican Rogers has taken a different approach. The schools have welcomed and integrated the wave of immigrants, legal and undocumented alike — and graduation rates have soared, for all students. But it didn’t happen overnight, and the work is far from done. This sprawling 256-square-mile district of rolling hills, with three high schools and 15 elementary schools, encompasses both paint-peeling trailer homes and the gated and guarded community of Pinnacle, whose mansions have as many rooms as some hotels. Nearer to the center of town are small apartment complexes and modest ranch-style homes, some of which house more than one Latino family. Results reflect her words. The district’s graduation rate for Latino students increased to 93 percent last year, from 72 percent in 2010 — far above the national average of 75 percent. College enrollment for Rogers’ Latino students grew to 41 percent last year from 32 percent in 2010. And for students of all ethnicities, scores on state math and English exams have improved in the same period. Related: What’s going on with all the missing high school graduation rate data? It’s a far cry from 1995, when the Office of Civil Rights found Rogers’ school district out of compliance because it had no certified teachers of English for Speakers of Other Languages (ESOL). It was also teaching more than 500 Latino students in a separate “academy.” The district began to take steps to address the problems, but a decade later, progress was limited. 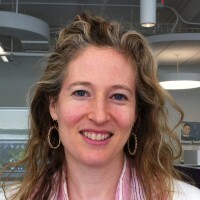 Martha Tompkins, Rogers’ ESOL director, said “a disconnect” between the Latino community and the schools needed to be bridged. In 2008, the administrators gathered a group of 35 Latino students over pizza, and talked to them about the big gap in graduation rates between white and Latino students. The students were surprised and disturbed. They formed their own leadership team and began working with the administration. That same year, when a new high school, Rogers Heritage, opened to accommodate the booming student population, the separate academy was abolished and the English language learners were integrated into the main high schools. A priority was put on hiring bilingual teachers and front office workers. Students new to this country were given a special advisor to help them. In Rogers, Arkansas, the school district is 44 percent Latino, with 35 percent of students not fluent in English. But after working their way through high school here, 93 percent of Latino students graduate. 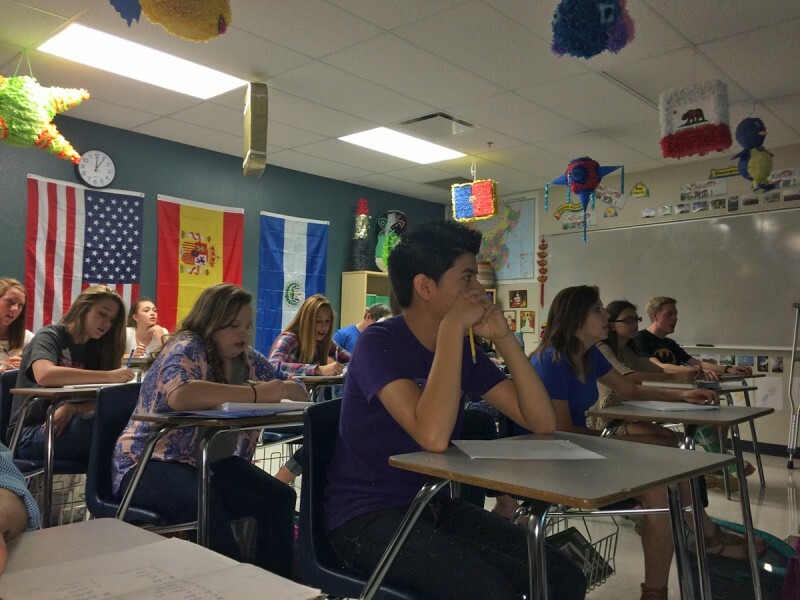 Bilingual juniors and seniors were paired with freshmen and sophomores who weren’t fluent in English. The high schools began to celebrate Hispanic Heritage month, replete with a school-wide dance called Latino Sabor, which now sometimes rivals homecoming in popularity. The Latino student coordinators encouraged the newcomers to get involved in school activities, like soccer, choir and student government. “In clubs and sports you really don’t have groups, you just mesh together,” said Heritage junior Javier Hernandez, 16, who runs track. But there was more to do. The Latino student leadership group urged the school to involve their their parents. In addition to translating all school materials into Spanish, the schools formed PADRES, which stands for Parents Advancing Readiness for Educational Studies (and means “parents” in Spanish). A couple dozen parents usually gather on Friday evenings at each high school, sometimes over tamales and hot chocolate, to discuss in Spanish anything from college scholarships to signs of teenage drug use. 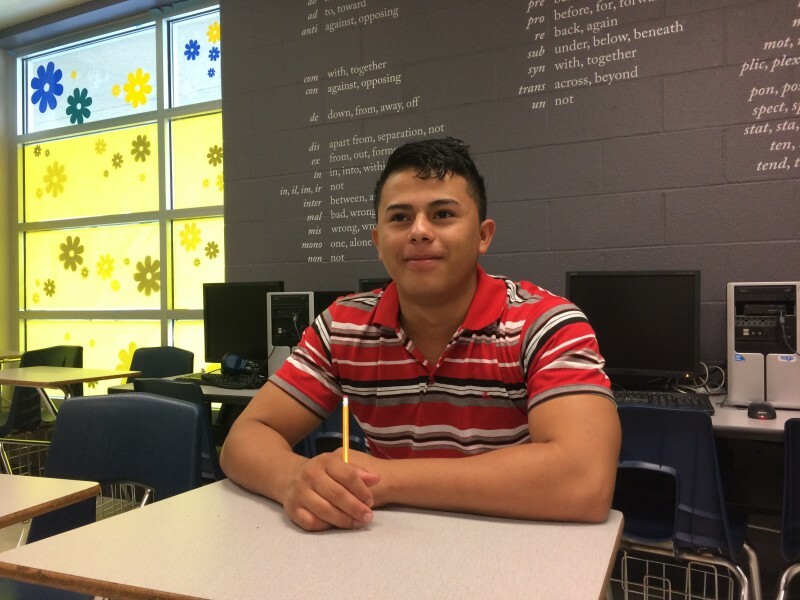 “My parents never came to the school, but it wasn’t because they didn’t care about me,” said Sergio Almaraz, a graduate of Rogers High who was born in Mexico and came to Rogers when he was 16. 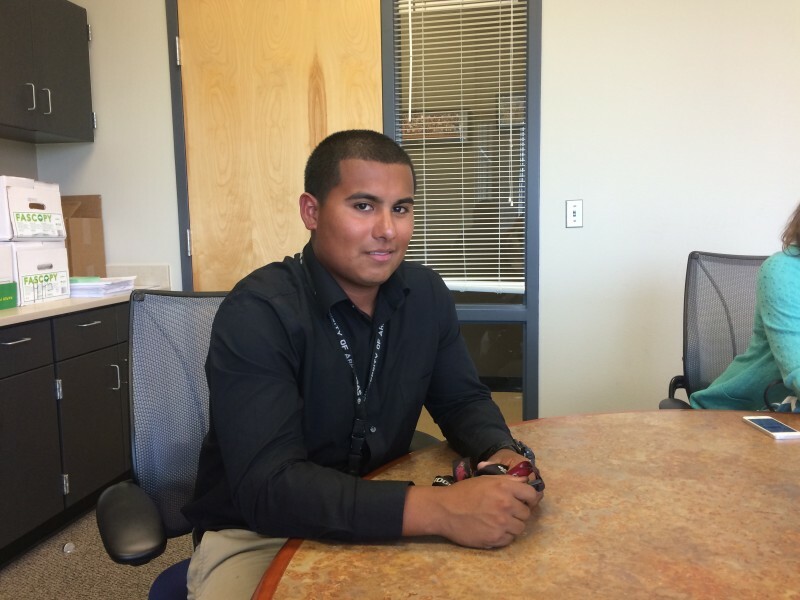 Now the father of four students in the district, Almaraz attends PADRES meetings at New Tech. Some teachers have gotten creative in their efforts to build relationships with Spanish-speaking parents, many of whom work long hours. Oscar Cardona told students in his native Spanish speakers class that they could get class credit if they brought their families to parent-teacher conferences. He managed to meet with 80 of his 90 students’ families, conducting most of the meetings in Spanish. While embracing Latino families helped, administrators also knew that they had to challenge their students more academically. In 2009, Rogers joined a statewide initiative aimed at increasing the number of students taking AP exams. 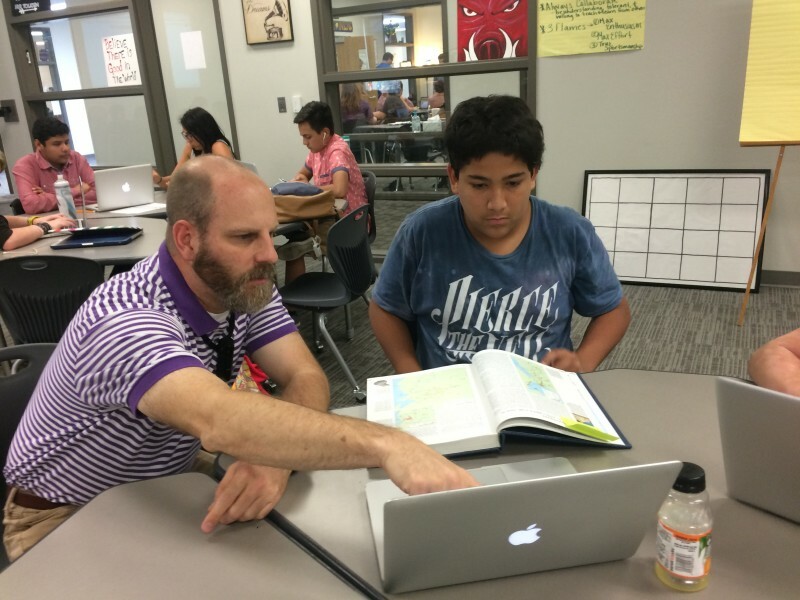 The district dropped most of its barriers to enrolling in AP classes (such as teacher recommendations and summer academic work) and opened classes to any student willing to try. Staff counseled more students to take the plunge. Teachers received training on how to support students who needed extra help. The results have been striking. Last year, 45 percent of Latino students enrolled in pre-AP or AP courses, up from only about 15 percent in 2008. And 29 percent of English language learners were taking the classes, a gain from 6 percent in 2008. In addition, the percentage of Latino students taking the ACT grew to 54 percent and to 39 percent for English language learners. 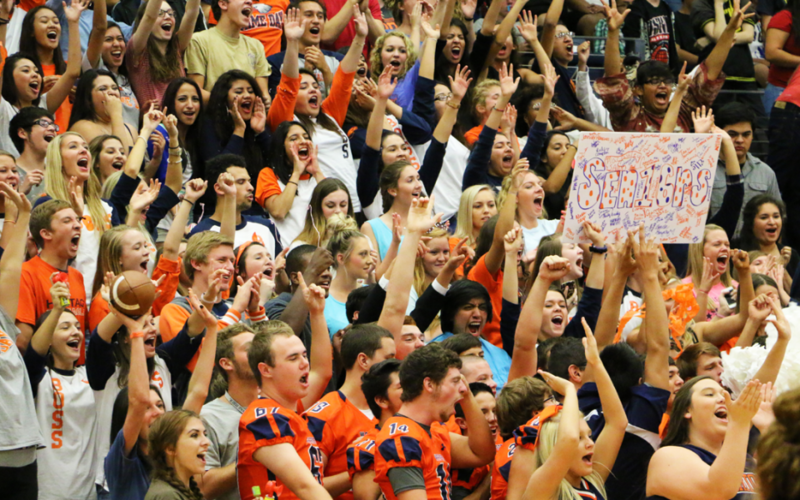 Last year, 1,303 students in Rogers took AP classes, almost double the number in 2008, and 39 percent passed the AP exam, compared with a 32 percent pass rate in the state. Teachers acknowledge that AP pass rates have dropped since they opened up access, but argue that scores are not all that matters. For example, Christhian Saavedra, who came to Rogers from El Salvador when he was 13, said he always got good grades in ESOL classes, but it didn’t give him much academic confidence. That changed when he took an AP Spanish class. The district also took a new approach to grading and homework. Teachers were encouraged to stop failing students solely for missing too many homework assignments. They also tried to weed out which homework was “busy work” and which actually advanced learning. Some ESOL teachers stopped giving extensive homework assignments and focused on completing the work in class, which aided students who were working long hours after school and on weekends to help their families. After the changes, the number of failing grades at Rogers High dropped almost 50 percent in the first semester of 2014-15 from the 821 recorded in 2009-2010. Rather than lowering the bar, as some teachers had feared, the district’s “grade inflation rate,” calculated by the state, was under 4 percent last year — about half Arkansas’ average. And all Rogers students began to do better on the statewide tests, as well. 45 percent of Latino students take pre-AP or AP courses, up from only about 15 percent in 2008. That fact may help explain why there hasn’t been more opposition to the integration of Latino students, even as anti-immigrant groups have been active in Arkansas. The reforms improved instruction for everyone, and those aimed at Latinos and English language learners didn’t carry much of a price tag. In 2011, Arkansas started holding school districts accountable for graduating all students within four years, and Rogers’ rates for English language learners (64 percent) and Latino students (72 percent) were low enough to bring the overall number down (79 percent). Now, Rogers’ two main high schools rank among the top five in Arkansas, which wouldn’t have been possible if English language learners had been left behind. Also, the area’s three main employers – Walmart, J.B. Hunt and Tyson – rely heavily on low-wage immigrant workers and seek to attract top talent in their corporate offices, regardless of country of origin. Bilingual workers are a plus, both for entry-level jobs and for those that require a college degree. Still, when it comes to attending college, the gap between Latinos and whites remains substantial. About 27 percent of English language learners enrolled in college last year; overall, 41 percent of Latinos and 62 percent of whites did. And most students don’t consider options beyond the University of Arkansas or the local community college. That may be because each high school guidance counselor has a caseload of about 450 students and, while there is a college scholarship coordinator, there is no dedicated college counselor to help students complete applications and find the right fit. Rogers’ leaders said their next hurdle is to find funding for a more robust college guidance program. And work at the other end of the school spectrum is vital, too, administrators said. Most of the elementary schools with large numbers of English language learners now require all their teachers to go through a state-endorsed ESOL training program, according to school principals. Rogers is also working to improve the diversity of its school staff at all levels. Almost all of the district’s administrative leadership council and principals are white. The school board is all white (a Latina candidate who ran in September for an open seat was handily defeated). While most teachers are white, a private grant helped the district hire nine Latino teachers this year. Teachers emphasize that hiring Latino staff is important so that all students have a diverse array of role models. They also say that for the students to be confident and successful, it’s important to affirm their own culture. She also said that, 20 years ago, most of the school viewed ESL students as the responsibility of ESL teachers. This story was written by The Hechinger Report, a nonprofit, independent news organization focused on inequality and innovation in education. Read more about high school reform. Are turnaround districts the answer for America’s worst schools?